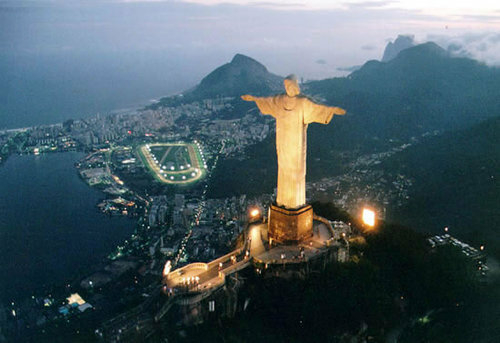 Did you know that aside from being a world famous icon of an exotic and fascinating city, the giant statue of Christ the Redeemer that watches over Rio de Janiero actually belongs to the Archdiocese of Rio de Janeiro and is officially a Catholic sanctuary? Although construction began on the statue in 1922, the idea to build a monument on the top of Rio's Corcovado mountain came in the 1850s from Catholic priest Fr. Pedro Maria Boss. The first time he pitched the idea to Princess Isabel, the idea was rejected. Only in 1921, when the Catholic Circle of Rio proposed the idea and began fundraising, did it stick. The parishes of the archdiocese donated whatever they could to go towards the construction of this monument. The reinforced concrete and soapstone structure was completed in 1931 and inaugurated October 12, 1931. Since then, tourists have flocked the Corcovado to visit the statue, riding the special railway that was build along with the statue. In 2006, the Christ the Redeemer statue turned 75 years old. To mark the occasion, the Archdiocese built a chapel in the base of the statue (the pedestal Christ stands on) dedicated to Our Lady of Aparecida -- the patroness of Brazil. The small chapel is taken care of by the Shalom community. Sunday Mass is celebrated in the chapel at 10am. Weddings and baptisms are celebrated there and Eucharistic Adoration is also held regularly. To mark the anniversary, the youth of Rio held a vigil at the base of the statue, followed the next day by mass, concerts, and performances by two of the city's famous Samba schools.